From left to right, Nick Sertic, Bill Hochstetler and Tim Palomaki in front of their building on Leja Dr., in the Vicksburg Industrial Park. They form the core of the operations at KEPCO with all of them wearing many hats. Hidden way back in Vicksburg’s Industrial Park sits KEPCO, a manufacturing company, little known to residents of the area but well-known in the niche market of electropolishing. It is owned by President Bill Hochstetler and general manager Paula Hochstetler, assisted by their two sons-in-law, Tim Palomaki (plant manager) and Nick Sertic (sales manager). This trio of men is sometimes dwarfed by their well-known wives – Paula, Angela and Rita who own Apple Knockers restaurant in downtown Vicksburg. Fortunately, that doesn’t seem to faze them when it comes to living in this small town and running their businesses. John Kurtz operates a process line (raw parts) to ensure consistent, quality electro polishing of large quantities of small parts. KEPCO (www.kepcoinc.com)was formed in 1983 and was known as Kalamazoo Electropolishing Company on Sprinkle Road, where Bill Hochstetler was the general manager until 1997, when he purchased the business. He moved it to Vicksburg’s Industrial Park in November of 2004, Sertic joined the company on April 1 of 2005, where he shared an office with Paula who was the plant manager then. What KEPCO invented for removing metal impurities with electropolishing was creative engineering according to Sertic. KEPCO’s unique machinery to process multiple parts for acid dipping was the secret to the company’s success at the time. They could do two million pieces a month with a device that automated the dipping process. They could process up to 20,000 pieces an hour to provide quick turnaround time and better control to the end product, Sertic explains. The company’s electropolishing process removes imperfections in metal from the surface called deburring, working only with stainless steel to protect the parts from rust and corrosion. In 2005 they were 40 to 45 percent into automotive work and since then have diversified into medical parts, water purification desalination pumps, and agriculture. “It’s not too complicated a process, as it’s based upon time, temperature and voltage. The voltage and time is the most important thing we need to do to keep the metal impurities coming out,” he explains. “We also do passivation with no electrical current, removing impurities which leaves a nice clean surface. Lots of time, we become a problem solver. You’ve got an issue, we try and fix it for you,” Sertic proclaims. Since they use nitric and citric acids in the process, they are closely monitored by the EPA. They have fashioned a waste treatment operation that recycles all acid and water, which is drained into the system and made into a cake like substance that is environmentally friendly. It’s a very green thing, according to Sertic. Working with family sometimes has its challenges, but this team seems to understand these and they make it work by also supporting the wives in the restaurant business. Paula wears several hats in both entities and that is easy to understand when it becomes known that she holds an aviator’s license, started a pet store in Three Rivers and then a pet grooming operation, too. She has bought and sold real estate and has been acknowledged as “the boss” for some time, Sertic proclaims. He works closely with brother-in-law Tim, who came from the military (Coast Guard) often going out to plant locations as the “ghost busters” team to solve problems in on-site passivation. Todd Weinberg stands in front of the huge combine that can harvest a big corn field in less than a day. “The future is brighter” says an understated Todd Weinberg. That wasn’t the case in March 2013. On oxygen 24 hours a day, lungs measuring 16 percent of expected function and unable to walk across the room without getting short of breath, the future was dim. Todd was not sure he’d make it to his 44th birthday in April. Todd’s journey to this point was not easy. At age 5, not gaining weight as expected and suffering from digestive problems, Todd was evaluated at Mott’s Children Hospital in Ann Arbor, Michigan. Parents, Mel and Jo were told their middle child had cystic fibrosis. With good medical care he might live to 17 or 18 years of age. Mel and Jo were determined to have Todd live as normal a childhood as he could. He went to school in Vicksburg taking a handful of pills with each meal. In middle school, he was healthy enough to play on the basketball team. At 15 years old he had his first hospital admission for a lung infection. Despite recurrent lung problems he played percussion in the Big Red Machine, admitting that some days it was pretty hard to march. Todd graduated from VHS in 1987. After graduation, Todd did what he always wanted to do: farm. Todd reports the first word he said was “tractor”. He had always worked on the farm with his dad, now he could farm full time. So he did. But, usually after the busy times in the spring and fall, Todd would need to get a “clean out”: intravenous antibiotics and breathing treatments to clean out infections and mucous from his lungs. At first this was done in the hospital, but then as technology improved he could get intravenous antibiotics and breathing treatments at home. This pattern of twice-a-year “clean out” continued for many years. Inevitably, Todd’s lung function declined. In 2005, his pulmonologist introduced the idea of a lung transplant. He was referred to the University of Michigan and followed by their transplant team since 2006. At that time, his lungs were functioning at 28 percent of what was predicted for a healthy 37 year old man of his size. He was told that when he was on oxygen and couldn’t walk across the room before getting short of breath he would be ready for a transplant. He continued to farm. In 2012, it became clear the time was getting near for a transplant. To improve the chances of successful transplant he first needed an operation to prevent reflux of stomach acid into his airways and new lungs. On May 14, 2012 he had laparoscopic surgery to tighten the sphincter (or valve) at the lower esophagus to prevent acid reflux. Fourteen days later while checking irrigation equipment in the field, the University of Michigan called to tell him that now they could put him on the transplant list. He agreed. He had to provide them with his cell phone number and four other contact numbers for them to call if he didn’t answer his phone. He would need to get to Ann Arbor within four hours when the donor lungs became available. September 27, 2012 at 5:40 p.m. while shelling corn he received the call: “We have lungs for you”. “I went numb; mind, body and spirit,” says Todd. By 8:30 p.m. he was in the cardiovascular unit at the University of Michigan where a central line (a large IV placed in the neck) and arterial line (a catheter in the radial artery at the wrist) were placed. He was taken to the operating room at 1 a.m.
At 2 a.m. the surgery team decided the donor’s lungs were not of good enough quality. Surgery was cancelled. He returned home, took a nap, then returned to harvesting corn. He was more relieved than disappointed. He realized that emotionally he had not come to grips with the reality of lung transplantation. He finished the harvest that fall. At midnight, December 12, 2012 he was called again. By 2:30 a.m. he was in Ann Arbor. Central and arterial lines again were placed. Surgery was scheduled for 1 p.m. Again the donor lungs were not satisfactory and surgery was cancelled. This time Todd reports “I was mad at the world for a while.” Shortly thereafter he realized how fortuitous it was that surgery was cancelled. He had an infection in his intestines (Clostridium difficile) that could have been devastating if he had the transplant and put on anti-rejection drugs that suppress the immune system. As it was, doctors were able to treat the infection successfully, but he was off the transplant list until it was cleared. By now Todd’s breathing was much worse. Everything was an effort. It was like breathing underwater. Lung function was now 16 percent of what predicted for a healthy 43-year-old man. Saturday, March 9, 2013 at 8:15 p.m., he was called again by the U of M. That night as he and his mother, Jo, drove to Ann Arbor, he told her, “I have a sense of peace about this.” Jo replied that she did too. At 11 p.m. he was in Ann Arbor and lines were placed again. Surgery was scheduled for 4 a.m. Todd recalls that night the clocks went ahead one hour for daylight savings time. He would wait one less hour. “It’s a go.” Surgery was done early Sunday morning. An incision was made horizontally across the entire chest and his chest was opened. Todd’s severely diseased lungs were removed and donor lungs placed. He was on a breathing machine for five days. Even in his drug induced mental fog in the ICU, he clearly remembers his mother gripping his hand and seeing his father’s face. He was up and walked a short distance the fifth postoperative day. He spent 11 days in the intensive care unit and 24 days in the hospital overall. Sore and weak he returned home. But five days later, on his birthday, he needed surgery in Ann Arbor to drain a painful hematoma (collection of blood) on his chest wall. Almost half a liter of blood was removed. Todd had to learn to stand from a seated position without using his arms because his chest would hurt so much. He had to walk every day to gain strength. Over 20 medications to prevent rejection of the transplanted lungs and prevent infections had to be taken on a strict schedule. Laboratory tests were done weekly. Spring planting approached. Todd reports, “I had more offers to help than I could shake a stick at.” The agricultural community was very supportive. Clay Rhoades, who had worked for Todd part-time before, stepped up and completed planting even sooner than other neighboring farmers. One month after transplant, his lung function was 71 percent of predicted for a healthy 44 year old man. He was no longer on oxygen. He was no longer short of breath. Six months after transplant his lung function is 93 percent of predicted for a healthy 44-year-old man. Breathing was easier. He notes that even his posture is better as his lungs expand normally. He is still sore. He can’t lift, push, or pull. His breathing no longer limits him but his stamina does. Follow-up testing has all been favorable. Four postoperative bronchoscopies (a procedure to look down the windpipe and bronchi with a fiber optic scope to inspect the lungs visually) have all shown his lungs to be healthy. Todd has never indulged in wondering. ’Why me?’ “What good would that do?” Waiting for the transplant wasn’t as anxiety provoking for him as it was for many around him. As a farmer, “I’m used to waiting.” You can’t speed up the time to harvest, you have to wait. Being given new life has put things in perspective for Todd. “I’m not going to worry. If I can’t do it today, I’ll do it tomorrow.” The future is brighter. To honor my dad, Meredith Clark, I’m calling this column “On the Corner.” He and my mom wrote and published the Commercial-Express for 26 years. The column “On the Corner” appeared every week on the left corner of the newspaper’s front page from 1947 to 1973 when they sold the paper. He usually wrote it the last minute before the weekly deadline and a good share of the news he wrote about came from his daily trip to the coffee shop at Marjo’s, the then-revered hangout of the town fathers. His vision was to support the schools and Village Council, but hold the elected officials accountable by writing the truth as he saw it. His writing was usually chatty, folksy and sometimes more like Will Rogers than the professional journalism I thought it should be. Nevertheless, it was the best read item in the newspaper, based upon surveys we would do every year. Our two communities celebrate four winning high school teams who have captured conference titles as we go to press. 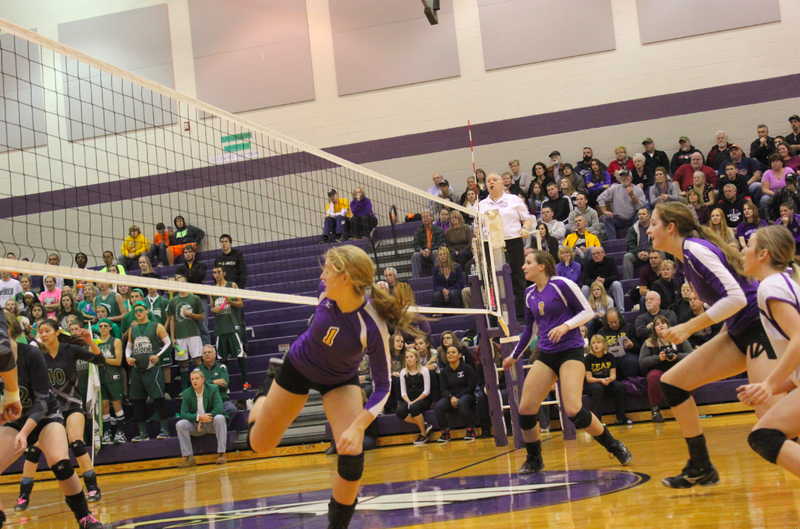 Vicksburg’s girls volleyball and cross country have snared the Wolverine Conference titles, and Schoolcraft’s volleyball and football teams have taken top honors in the Kalamazoo Valley Conference. It is especially important to this new newspaper to provide the opportunity to showcase our student athletes in story and pictures on the printed page. Let me introduce to our readers some of the contributing “scribblers” for this newspaper whose writing is featured in this issue. Doctor David Schriemer of the Vicksburg Family Doctors practice has written gripping stories about survivors in our last three issues. The people he has chosen to profile have a rich story to tell land he has deftly written about their saga, showing the very human side of their lives. Company and then Bronson Hospital, having come from the Kalamazoo Gazette staff after earning a nursing degree. Go figure. Morgan Macfarlane from Schoolcraft is herself learning the trade as a high school senior who is dedicated to becoming a journalist. She began taking journalism courses at Western Michigan University as a junior and is now editor of the electronic high school newspaper called the Screaming Eagle. She has a bright future and we are glad to give her a chance to listen and learn about her community of Schoolcraft. started a branch of the Kalamazoo Family Valley Church in Battle Creek. Although he is a Vicksburg area-resident, he serves the new church as a lay minister. He put in his years of selling real estate with his father J.R. Fulton, while battling a rare form of cancer that was diagnosed when he was 14. He’s a survivor at the ripe old age of 52 and is hoping to keep the disease at bay for many more years. Leeanne Seaver is a newcomer to the area after 25 years of living in Colorado and Virginia, leaving Vicksburg upon graduating from high school in 1978. She specializes in technical writing and is an accomplished photographer. Her journey has largely settled on advocating for the deaf since she has a son who is severally impaired but now is a successful college student. Mari Smith is covering Vicksburg sports this fall including volleyball, soccer and tennis. She has an abiding interest in education with twin daughters just graduating last year and a son several years before that. She and her husband own a construction company, plus she volunteers at Indian Lake School, as a reading instructor. Durti Morton is new to Vicksburg, having recently moved from Pittsburgh to marry Dr. Dustin Morton, a local chiropractor. They are the revivalists of the Haunted House that proved to be so successful for the Chamber of Commerce the last few weeks. Lastly, there is one unsung hero who makes us all a bit better with her editing capabilities. It is Sandy Minger, our fearsome proof reader, with the mighty red pen. We truly appreciate her specialty that she learned while working for Jackie and Warren Lawrence at the now defunct Commercial-Express. Ed Bernard looks over a recent edition of the South County News in his office just north of Schoolcraft on US 131. Ed Bernard, a champion of people, started Bermo with literally nothing, and in 40 years has created a giant in the wholesale clothing industry; and his headquarters has been on US-131 in Schoolcraft for the last 20 years. He opens the doors of the local warehouse for every winter and summer sale, not so much to get rid of excess inventory, but because his staff of 55 in the Schoolcraft facility love to see their friends and neighbors come in to shop . “It connects us to the community with our great product at very low prices and we can give our neighbors great value,” Bernard points out. He is usually at the front door on sales days to greet the customers. In fact, he has been connecting with the greater Kalamazoo community since he arrived here in 1973 to start a jeans retail business from his home in Chicago. He has been here ever since, while opening wholesale and retail outlets all over the United States. The company sources their manufacturing from China, Pakistan and Bangladesh, has a sales office in New York City and for years, operated Mr. B’s Wearhouse and Max 10 in Kalamazoo. Bermo also licenses the Farmall and Case IH labels for apparel distribution all over North America. “There is a much better margin online than we see in retail these days as we don’t have the bricks and mortar stores with their big overhead to deal with so much anymore,” he says. He chose the Schoolcraft site to build offices and warehouse space because it was perfect for truckers, customers and employees to navigate. Their previous location on Glendenning in Kalamazoo had tough limitations due to traffic routes, thus the access to I-94 and US 131 was ideal. Bernard went to the University of Oklahoma on a tennis scholarship, but only had two years of school before he entered the working world back in Chicago’s garment district. Even though he does not have at least a bachelor’s degree, in 2011 he was asked to teach a business decisions class at Kalamazoo College. His next real love is tennis, and in 2000 he decided that he wanted to try to win a gold medal in the Maccabiah games in Israel in 2001. After qualifying for the American team, he sat down with his wife to decide how to best train for the event. Since he still had one year of college eligibility they decided that competitive college tennis would be the best training. Bernard played on the team for five months while becoming a full time student. He was 49 years old. It was to be the thrill of a lifetime to compete with over 10,000 other players from 60 countries; but a few weeks before the event, Bernard and many other athletes decided not to go because of the increase of bombings in Israel. He did win gold in doubles in 2003 in the Pan Am Games in Santiago, Chile. Bernard considers himself more of a singles player with a strong forehand and thus decided to try again for the main event over in Israel in 2009. In a very tense week with his family and friends watching, he won the gold medal in singles after not being seeded(favored) to do so. “My wife and I were treated like rock stars when I wore my medal at the airport. We were surrounded by many people wanting to know what sport I participated in. It was such an honor,” he says. “I’m proud of being in business this long, having started with nothing,” as he deftly displays the first dollar he ever made back in 1973, hanging on the wall of his office in Schoolcraft.